Protesters march with sign reading "The Forest is Ours," demanding a stop to massive logging in the Bialowieza forest, one of Europe's last virgin woodlands, in Warsaw, Poland, June 24, 2017. Hundreds of environmentalists protested in Kraków Tuesday against widespread logging in Europe's last primeval forest as a conference of the UNESCO World Heritage Committee got underway in the historic city in southern Poland. The environmentalists demanded that the Polish government stop felling trees in the Białowieża forest, a UNESCO World Heritage site that straddles the border with Belarus. The forest of nearly 142,000 hectares is one of the last and largest remaining parts of an immense primeval forest that stretched across the European Plain 10,000 years ago. Separated by a police cordon, forest rangers held a counterdemonstration in Kraków. 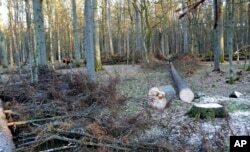 They support the government's explanation that selective logging will help save the forest, which is north of Brest, the Belarusian capital, and Białystok in Poland. FILE - In this photo taken March 24 , 2017 in the Bialowieza Forest, in Poland, a bison stands next to fir trees that have been logged. The forest is home to many rare species of birds and plants as well as hundreds of European bison, the continent's largest mammals. It contains a number of large, ancient oak trees, survivors of the wars in Eastern Europe during the 20th century and many earlier conflicts; the biggest trees, named after historical figures in many cases, have circumferences of over 600 centimeters (20 feet) and stand over 30 meters (98 feet) tall. The government said it increased logging to fight an infestation of bark beetles that has affected many spruce trees. Ecologists claim authorities have been felling not only infected trees but also healthy ones. They contend the government's stand is a pretext to increase timber production for profit. Scientists and the European Union, which says the increased logging is illegal, have also protested the logging. In late April, the European Commission gave Polish authorities a “final warning” to address its concerns over the forest or face being summoned by the EU's top court. The UNESCO committee, meeting in Poland through July 11 in its 41st annual session, is expected to decide Wednesday whether to send a mission of experts to the Białowieża Primeval Forest to reassess the situation.